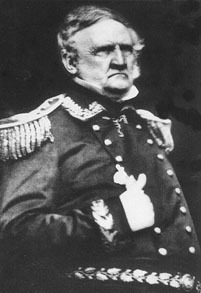 The American general Winfield Scott was born near Petersburg, Virginia, on the 13th of June 1786. In 1805 he entered the College of William and Mary, where he studied law, and he continued his studies in the law office of David Robertson in Petersburg. In 1807 he removed to Charleston, South Carolina, but as war with England seemed imminent he soon left for Washington DC and offered his services. In 1808 he was commissioned as a captain of artillery, recruited a company in Richmond and Petersburg, and was ordered to New Orleans. His criticism of his superior officer, General James Wilkinson, led to his being suspended for a year, but the term was eventually reduced to three months. In July 1812, as a lieutenant-colonel of artillery, he was sent to the Niagara frontier and fought at Queenston, where he was taken prisoner. He was exchanged in January 1813, became colonel in the following March, in March 1814 was promoted to the rank of brigadier-general, and in July received the brevet of major-general. In the battles of Chippewa (5th July 1814) and Lundy's Lane (25th July) he took a conspicuous part, being twice wounded in the latter engagement. For his services he was presented with a gold medal by Congress and with a sword by the state of Virginia. Among the difficult tasks that he was called upon to perform between 1815 and 1861, for the last twenty years of which period he was the commanding general of the U.S. Army, were: an expedition to the Middle West in 1832, where, after the end of the Black Hawk War, he negotiated treaties of peace with the Sauk, Fox, Winnebago, Sioux, and Menominee Indians; a journey to Charleston in the same year to watch the progress of the nullification movement, and to strengthen the garrisons of the forts in the harbor; an expedition in 1836 against the Seminole Indians in Florida; the supervision of the removal in 1838 of the Cherokee Indians from Georgia, North Carolina, Alabama and Tennessee to the reservation set apart for them by treaty west of the Mississippi river; a visit to the Niagara river in the autumn and winter of 1838 to put an end to the acts by Canadian insurgents in violation of American neutrality; a similar mission to Maine in 1839 to restore tranquillity between the citizens of Maine and New Brunswick, who were disputing the possession of a tract of land along the Aroostook river; and a journey to the north-west in 1859 to adjust a dispute between American and British officers concerning the joint occupation of San Juan Island in Puget Sound. His greatest achievement was the brilliant Mexican campaign of 1847. As the senior officer of the army, he was placed in command of the invading expedition, and after capturing Vera Cruz (March 29th, 1847), and winning victories at Cerro Gordo (April 18th), Contreras-Churubusco (August 19th-25th), Molino del Rey (September 8th), and Chapultepec (September 13th), he crowned his campaign by the capture, on the 14th of September, of the Mexican capital. In March 1848 he received a vote of thanks from Congress, which ordered a gold medal to be struck in commemoration of his services. Scott appeared to have an excellent opportunity for a political career; his nomination for the Presidency by the Whigs had been suggested in 1839 and in 1848, and in 1852 he received it; but his candidacy was doomed to failure. The Whigs, divided on the slavery question, gave only half-hearted support to their compromise platform; and Scott made several extemporaneous addresses which did him harm. He received the electoral votes of only four states -- Kentucky, Virginia, Massachusetts and Vermont. This defeat, however, detracted nothing from the esteem in which he was held, and in 1852 the brevet rank of lieutenant-general was created specially for him. Among the other honors conferred upon him were the degree of Master of Arts by Princeton in 1814, and the degree of Doctor of Laws by Columbia in 1850 and by Harvard in 1861. At the outbreak of the Civil War, though a Virginian, he remained at the head of the United States armies and directed operations from Washington until November 1861. He then visited Europe for a short time, and after returning wrote his Memoirs, published in 1864. He died at West Point, New York, on the 29th of May 1866.